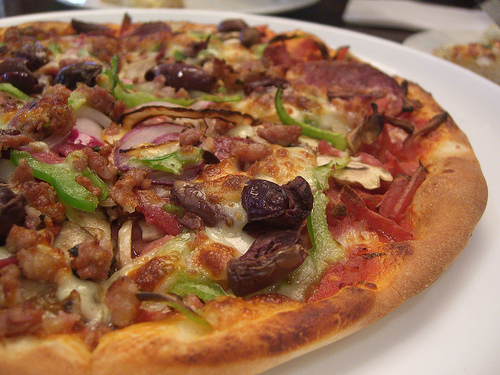 Oh, the joys and delights of that perfect food… pizza. Just looking at this picture is making me drool, how about you? Takeout pizza always seems to taste better than homemade, doesn’t it? It’s partly because of their specialty pizza ovens, but it’s mostly the excessive amounts of grease and salt. Frozen pizzas are often full of MSG and artificial flavours. Not to mention the potential risk of PFC’s in the boxes! For those of us trying to save a little money, and keep our families healthy, here are a few tips on making your homemade pizzas super-yummy. After experimenting and tinkering with lots of different recipes, I’ve come up with what I believe is the perfect pizza dough. Doing it in the food processor makes it easy and fast. This recipe is just right for a thinner-crust 16″ pizza, a rectangle pizza on a standard cookie sheet, or a thicker-crust 12″ pizza. This recipe also has the perfect balance of white to whole wheat flour for my tastes, but if your family is used to a stronger whole wheat taste then feel free to change the proportions! And it goes without saying to use organic ingredients wherever possible. Stir the yeast and brown sugar into the warm water and let sit for 5-10 minutes. Combine flours, garlic powder, and salt in a food processor fitted with a kneading blade. Whiz to combine. Add the egg and whiz. When the yeast is ready, stir the oil into it, then slowly pour the mixture into the flour with the food processor running. A few seconds after it’s all added the dough should form into a ball. Run the processor for about 15 seconds, then let it rest for 5-10 seconds. Repeat this step a couple more times, this kneads the dough quickly and easily! Turn the dough into a glass or metal bowl (it should be just a little bit sticky), lightly coat with olive oil, cover with a damp cloth and leave to rise for about an hour. Then it’s ready to shape, top, and bake! Tip for great rising: If your kitchen is chilly (say, it’s winter and you’re trying to save energy), turn your oven on to about 175F when you start making the dough, and turn it off as soon as it reaches temperature. It will stay warm and be just right for proofing your dough. Making your own pizza means endless choices of toppings. You can personalize it according to your preferred tastes as well as your own family’s green and nutritional philosophies… from homemade sauces, to vegan “cheese”, free-range chicken, fresh veggies from your garden, and grass-fed beef, the variations are mind-boggling! Prepare your toppings while the dough is rising. After the dough is risen, preheat your oven while shaping and topping. Grease your pizza pan with olive oil. Use a pizza stone if you’ve got one. Try combining different cheeses. Mozzarella and cheddar are the most common and “typical”, but experiment with jack, provolone, and feta. Don’t forget the parmesan – or try romano for extra flavour. For super-stretchy and gooey cheese, use large, thin slices instead of grating it. Grated or sliced, put the cheese on the bottom, right after the sauce. If using parmesan, sprinkle that on the top. Sprinkle herbs (like oregano) either directly on the sauce or on top of the whole thing. For a super-greasy but yummy result, carefully drizzle about a tablespoon of olive oil over the toppings. Cook your pizza at a high temperature (425-450F) for a short time — this is the closest imitation to the specialty pizza ovens. Don’t overcook! Keep a close eye on it. At high temperature, it can be done in less than 10 minutes. To make a frozen pizza, put the cheese on first, then the toppings, and then the sauce on top. Bake like you would any store-bought frozen pizza. Helping put toppings on a pizza is irresistible to kids, even those most disinclined to helping out around the house. Older kids can grate cheese or slice veggies, and even the youngest can help put everything on. Fussier kids can prepare their own personal section of the pizza with their favourite toppings. Just make sure you’ve prepared more toppings than you’ll actually need for the pizza — much of it will be eaten straight out of hand! Finally, if you’re curious, here’s our family’s favourite combo. We’re pretty traditional pizza-wise. I’m still searching for the perfect tomato sauce (actually I know exactly where it is, but it’s a friend’s secret recipe and he won’t share! ), but that’s where we start. Then I cover that with stir-fried ground beef, then lots of mozzarella and cheddar. Mushrooms sliced very thin, red pepper strips, sometimes onions, loads of pepperoni, and then parmesan and oregano. Yummmmmm!